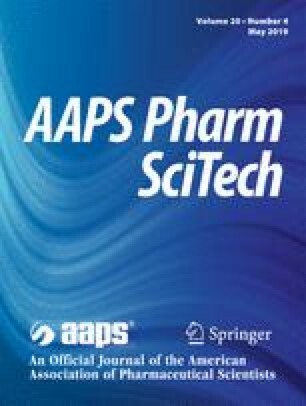 The aims of this study were to prepare hydrogenated soybean phosphatidylcholine (HSPC) matrices by hot melt extrusion and to evaluate resulting matrix potential to extend drug release in regard to drug loading and solubility for oral drug delivery of water-soluble drugs. The liquid crystalline nature of HSPC powder allowed its extrusion at 120°C, which was below its capillary melting point. Model drugs with a wide range of water solubilities (8, 20 and 240 mg/mL) and melting temperatures (160–270°C) were used. Extrudates with up to 70% drug loading were prepared at temperatures below the drugs’ melting points. The original crystalline state of the drugs remained unchanged through the process as confirmed by XRPD and hot-stage microscopy. The time to achieve 80% release (t80) from extrudates with 50% drug loading was 3, 8 and 18 h for diprophylline, caffeine and theophylline, respectively. The effect of matrix preparation method (extrusion vs. compression) on drug release was evaluated. For non-eroding formulations, the drug release retarding properties of the HSPC matrix were mostly not influenced by the preparation method. However, with increasing drug loadings, compressed tablets eroded significantly more than extruded matrices, resulting in 2 to 11 times faster drug release. There were no signs of erosion observed in extrudates with different drugs up to 70% loadings. The mechanical robustness of HSPC extrudates was attributed to the formation of a skin-core structure and was identified as the main reason for the drug release controlling potential of the HSPC matrices produced by hot melt extrusion. The online version of this article ( https://doi.org/10.1208/s12249-019-1366-3) contains supplementary material, which is available to authorized users. This work was supported by Phospholipid Research Center (Heidelberg, Germany). The authors thank Eva Hepke (Technische Universität Berlin) for technical support with XRPD measurements.